Our approach to cosmetic dermatology places the health of your skin first. We are dedicated to providing a thoughtful, comprehensive cosmetic plan that addresses patient needs, while being mindful of recommending the best value for your investment. We are Board Certified Dermatologists with a combined 25+ years of aesthetic training, administer all injectable treatments including Botox®, Dermal Fillers, Kybella®, and Sclerotherapy. 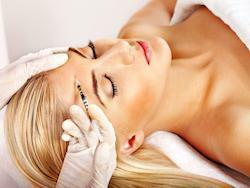 Our cosmetic dermatologists are in the top 5% of all Botox injectors in the country. Never before has laser skin resurfacing been so safe, effective and easily tailored to your skin type and aesthetic needs. The latest technology in skin resurfacing, the Fraxel® dual laser combines deep and superficial wavelengths of light to address multiple concerns in one treatment. The 1550 setting targets fine lines and wrinkles, while tightening skin to leave a younger appearance. It is also capable of minimizing scarring from acne, trauma or surgical procedures. The more superficial, 1927 setting gives skin a brilliant glow by removing age spots and sun damage. This unique, dual technology, enables customization of treatments, based on our patient’s specific needs. Only board certified dermatologists with extensive training in administering laser surgery provide this service to our patients, offering a combined 25+ years of experience. Botox® and Dysport® provide a safe, non-invasive approach to reducing fine lines and deep wrinkles. They are proteins that work at the neuromuscular junction to temporarily relax the muscles causing unwanted wrinkles, and to prevent new wrinkles from forming. Only board certified dermatologists with extensive training in administering Botox® and Dysport® provide this service to our patients, offering a combined 25+ years of experience. Fillers are injectable gels that temporarily add volume to the skin. We offer a wide range of both Hyaluronic acid and PMMA/Collagen fillers that are specifically tailored to our patient’s needs. Hyaluronic acid (HA) fillers include Juvederm Ultra XC®, Juvederm Ultra Plus XC®, Voluma® Volbella® These are temporary fillers that commonly last 9 to 12 months; however, Voluma® may last up to two years. HA is a naturally occurring substance in the skin and does not require prior allergy testing. Bellafill® is a semi-permanent filler using a combination of collagen gel and biocompatible PMMA microspheres. The collagen works by adding immediate volume while the PMMA creates a matrix to stimulate your body’s own collagen production. Lasting five years, it is one of the longest lasting fillers available. Bellafill® requires a skin test to identify patients who may be allergic to bovine collagen. Only board certified dermatologists with extensive training in administering dermal fillers provide this service to our patients, offering a combined 25+ years of experience. Many patients are frustrated by the appearance of fullness under the chin, which is often referred to as “double chin." This is a difficult area to improve with weight loss alone. Kybella® is a safe, effective treatment to reduce unwanted fat and tighten skin under the chin. It is a naturally occurring molecule in the body that aids in the digestion and absorption of unwanted fat. When injected into the fat beneath the chin, it causes destruction of fat cells. The destroyed cells can no longer store or accumulate fat. Most patients experience visible results within two to four treatments. Each treatment is administered one month apart and the results are permanent. Mild swelling, bruising, discomfort, numbness and redness are common. Acne scarring can be an emotionally distressing condition for patients. Our board certified dermatologists understand this and will start by addressing and treating any active outbreaks. Acne scarring is complex and often needs combined therapies such as laser resurfacing with our Fraxel® dual laser system, filler agents such as Bellafill, dermabrasion, and subscisions. Let our experienced physicians choose the best treatments for you. While most scars become less visible over time, some scars can be problematic. The appearance and sensation of scars can be improved through a variety of methods including topical agents, therapeutic injections, laser therapy and surgical scar revision. The Cutera Excel V™ laser is a safe and effective to rid yourself of unwanted veins. This fast and easy procedure uses cutting edge technology to comfortably fade you unwanted vessels after 1-3 treatments. The laser uses specific wavelengths of light target oxyhemoglobin in your vessels. There is a transfer of energy that renders the vessels incompetent, ensuring maximum results with minimal down time. Laser treatments are often combined with sclerotherapy to maximize results. Asclera is a sclerosant solution that is injected in small leg veins. After injection, the solution displaces the blood and irritates the inside of the blood vessel. The body creates an inflammatory response that destroys the damaged vessel. Blood flow is redirected to healthy vessels. Mild swelling and bruising can occur with treatment and patients are encouraged to wear compression stockings for a short period of time following treatment. A consult with your board certified dermatologist will determine which treatment or combination of treatments is best for you. Whether you suffer from rosacea or have diffuse redness from sun damage, facial redness can be uncomfortable and embarrassing. Topical creams and oral medications often fall short of targeting redness, flushing and dilated facial vessels. Fortunately, the cosmetic dermatologists at ASCS can help you to find the best combination of therapies. Lasers deliver energy to the skin which is absorbed by blood vessels, scars, port wine stains, and other vascular lesions. Multiple treatments are required for optimal results. The physicians at ASCS use cutting edge laser technology including the Cutera Excel V™ laser. Schedule a consult to learn more about treating facial redness. MiraDry is a non-invasive permanent treatment for underarm sweating, odor and hair. This system is the first and only FDA-cleared device that with as little as a single office appointment, will permanently destroy the sweat and odor producing glands in the underarm. Results are immediate and long-lasting with little post-procedure downtime. With miraDry, you can throw away your anti-perspirants forever, feeling confident and clean all day long. Our Clinical Cleansing Facials are a great way to energize your skin and promote cellular renewal. We offer complete, customized, medical-grade facial treatments using only the finest ingredients that are clinically proven to offer results. Whether your skin is dry, oily, dull or irritated, this treatment will be customized to meet your individual skin care needs. This treatment includes a thorough cleanse with optional steaming, exfoliation, extractions, treatment masque and an application of skin care products targeted to treat your skin care concerns. Facials are ideal for a first time patient or as maintenance between treatments. At minimum, you should have a facial with each season change to reevaluate your skin care needs and skin care regimen. Facials are most effective when repeated every four weeks. Teen treatments are ideal for any adolescent 18 years or younger who may be experiencing challenges with their skin such as: acne, blackheads, oiliness, milia, or dry, sensitized skin. Skin care recommendations and the importance of a consistent home care regimen are discussed and reviewed during this treatment. All teens 18 years or younger must be accompanied by or have consent from a parent or legal guardian during the time of treatment. This treatment begins with a thorough cleanse and optional facial steaming to soften the skins surface prior to manual extractions or removal of comedones (blackheads) and milia (whiteheads). This treatment is not limited to the face as comedones and milia are often present on the face, chest and back. This treatment should be repeated as often as needed. This is the the perfect treatment for those patients who want to stay ahead of the aging process. This safe, fractional laser technology rejuvenates skin gently, quickly, and comfortably. Patients report visible improvement of brown pigment and pore size, while experiencing an illuminated skin tone and ultra soft texture after just four - six treatments. The minimal discomfort and social down time required for this treatment have dubbed it “the lunch-time laser,” as you can easily have the quick, 20-minute procedure done and leave the office with only minimal pinking of the skin. This celebrity favorite is one of the best kept secrets for red carpet prep. 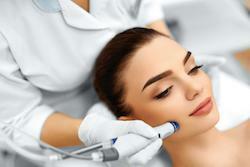 Laser genesis technology is a non-invasive procedure that gently heats the deep dermis to stimulate collagen formation. The effect is a reduction in the appearance of blemishes, scars, redness, minor wrinkles and an overall improvement in skin tone. There is no down time associated with this 30 minute procedure and you will leave the office with a slight flush that will evolve into a luminous glow. This non-invasive, non-surgical procedure provides optimum exfoliation, leaving your skin feeling renewed, restored and rejuvenated. Our DiamondTome® Microdermabrasion Treatment gently exfoliates the outermost layer of skin using a diamond-encrusted wand and vacuum suction to remove dead skin cells in a controlled manner. This creates a smoother texture and stimulates the growth of healthy new skin cells, leaving your skin more supple and vibrant. This treatment can be completed in a short period of time, without pain and requires no down time from work or social activities. Results are progressive and continued treatments are highly effective for improving fine lines, skin texture, comedonal acne and sun damage. To achieve maximum results, a series of six-eight treatments spaced two weeks apart or maintenance treatments every three months. This treatment is not recommended for inflammatory skin conditions. This soothes dry, sensitized skin and repairs the skin’s barrier function with our Hydro Wand infused lipid treatment. Our DiamondTome Hydro Wand® delivers a slow, pressurized flow of lipid recovery serum for ultimate skin hydration. This treatment is ideal following a facial, MicroPeel or MicrodermabrasionTreatment. Our MicroPeel treatment is our most popular facial treatment. This three-step exfoliating procedure combines dermaplaning (also known as blading,) a chemical peel application and cryogenic therapy to reduce the appearance of fine lines, laxity, dullness and skin imperfections. This is the ideal treatment prior to an upcoming event as your skin will immediately appear brighter, more youthful looking and will leave your skin feeling very smooth. For optimal results a series of four-six treatments at four week intervals is recommended. 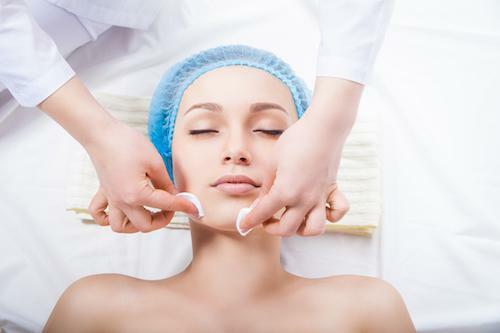 Dermaplaning is a manual, physical exfoliation technique that safely and efficiently removes surface debris with a dermaplaning blade. The dermaplaning blade is held against taut skin at a 45-degree angle and stroked in a manner similar to shaving. The primary benefit of dermaplaning is exfoliating dead skin cells and the secondary benefit includes the removal of fine facial hair (peach fuzz.) This treatment has many benefits and is quick, safe and effective with no downtime. For optimal smooth skin results, repeat treatments are recommended every three-four weeks. Chemical Peels benefit individuals with acne, facial blemishes, fine lines, wrinkles, and uneven pigment (brown spots.) We offer a variety of chemical solutions to enhance and improve the texture and appearance of facial skin by removing old skin cells, revealing a fresh, new layer of skin. Our peel treatment plans are determined upon consultation so that we can offer the best possible outcome for your skin type and skin condition. Chemical Peels are listed lightest to strongest. The Sensi Peel® is ideal for treating rosacea, highly sensitive or ethnic skin types. This gentle 6% TCA peel calms the redness and inflammation associated with rosacea. It also improves hyperpigmentation, treats acne and acne scarring, brightens the skin tone and tightens aging skin. Your skin may peel three-five days after the peel is applied although peeling does not always occur. For optimal results, repeat this peel in four week intervals. The Illuminize Peel® is appropriate for first time chemical peel patients or anyone looking for a gentle, superficial peel. This peel gives you the benefits of a chemical peel without the downtime and irritation typically associated with other chemical peel agents. This peel is especially beneficial prior to any special upcoming event at which you want to look your best. Your skin will look rejuvenated and glow. Illuminize Chemical Peels are most effective when done in a series of three-six treatments at four week intervals. Earn Brilliant Distinctions points with this peel! The Vitalize Peel® is one of our most popular peel treatments for reducing acne and breakout frequency. The Vitalize Peel is composed of: lactic, salicylic, resorcinol, and retinol acids. This gentle, superficial peel is ideal for acne scarred and blemished prone skin, aging skin, melasma and hyperpigmented skin or for those who want to improve their skin quality. Results are noticeable after just one peel ; however, most effective results are seen after a series of four-six peel treatments. Peeling is visible 48-72 hours after the solution is applied and may continue for approximately three days. Earn Brilliant Distinction points with this peel! The Rejuvenize Peel™ is an ideal treatment for someone who has established tolerability to the Vitalize Peel. This peel is indicated for moderate to severe skin conditions including sun damage, fine lines, wrinkles, acne, acne scarring and melasma. Moderate peeling starts approximately two days after the procedure and can last up to five days. For optimal results, a series of four-six chemical peels at four week intervals is recommended. Earn Brilliant Distinction points with this peel! The VI Peel® is the deepest of our chemical peels and is highly effective at improving acne and acne scarring, uneven skin texture and tone, fine lines, wrinkles, age and sun spots and hyperpigmentation. The VI Peel is composed of five rejuvenating acids: TCA, Retin-A, Salicylic Acid, Phenol and Vitamin C. Peeling is visible 48 hours after the solution is applied and may continue for three-seven days depending on skin type and condition. Results are typically noticeable within a week following the treatment. For optimal rejuvenating results, a series of three-six peels are recommended at four week intervals. Our Soprano ICE™ 810 Diode Laser provides lasting hair-free results from a series of relatively short sessions. Patented In-Motion ™ technology treats sensitive areas without the discomfort of other systems. By using a sweeping, paintbrush technique, the procedure is shorter, more comfortable and yields great results. 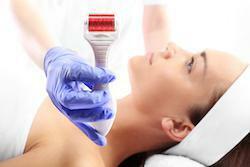 All aesthetician-administered laser hair removal treatments are supervised by a board certified dermatologist. Whether you are looking for a healthy skin care routine to prevent and correct early signs of aging, simply having a difficult time finding skin care products that address your specific skin care needs or desire cosmetic treatment options to enhance your facial features, our aestheticians will educate and provide you with the information needed to obtain your skin care goals. This 30-minute customized consultation is spent addressing your primary skin care concerns. You will be educated on the appropriate skin care regimen and cosmetic treatments our clinic offers to meet your individual skin. Have a special event coming up that you and your friends want to look flawless for? We’ve got you covered! Get everything you need to get your glow back and have flawless skin with our Flawless package that offers special pricing on facials and laser treatments! This therapy targets those stubborn fat pockets and deposits – large and small -- that you can’t shed with exercise and diet alone. truSculpt® takes a multi-dimensional approach to body sculpting and circumferential reduction. This monopolar radiofrequency device delivers precise heat to the subcutaneous fat, causing the fat cells to die and melt away. Average treatment session is 15-30 minutes. Each treatment provides a 20-35% reduction in the fat pad. The device is safe to use anywhere on the body. There is minimal discomfort and no downtime! This Targeted, Repeatable and Uniform approach ensures TRU 3D results are achieved. 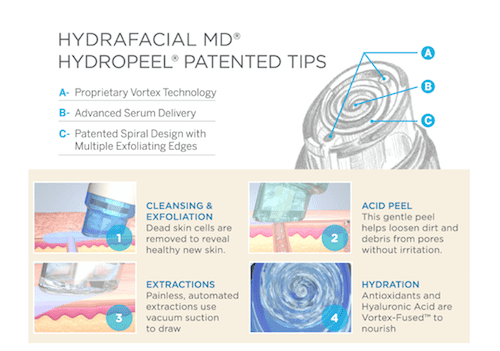 HydraFacial MD is a medical grade, facial resurfacing treatment that promotes long-term skin health benefits. This multi-step procedure cleanses, evenly exfoliates and extracts to remove impurities and dead skin cells while simultaneously replenishing vital nutrients including antioxidants and hyaluronic acid using patented Vortex-Fusion technology. The treatment is safe for all skin types with NO DOWNTIME. The Signature HydraFacial is a classic and one that all patients love. The Deluxe HydraFacial takes the signature facial to the next level with the addition of specialty serums including Stem Cell/Growth Factor, DermaBuilder, and Britenol. The Platinum HydraFacial is the same as the Deluxe with the addition of lymphatic massage and LED light therapy.